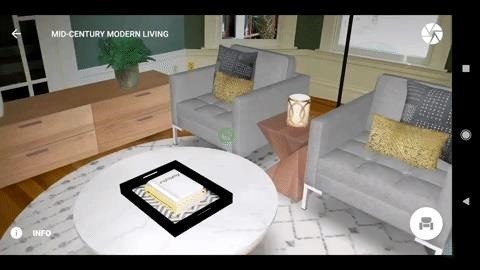 Just weeks after officially launching its mobile augmented reality toolkit, Google can now claim one of its first Android and ARCore app exclusives with the Curate app from Sotheby's International Realty. Available now in the Play Store, Curate operates similarly to furniture visualization apps like IKEA Place and Houzz. The app allows users to visualize full interior designs, such as living rooms, dining rooms, offices, and bedroom suites, and quickly swap out designs and capture screenshots of the results. Unlike its predecessors, the app is aimed at the real estate market, allowing sales associates to easily stage homes for prospective homebuyers. "Buying a house is not only a significant financial decision, but is also deeply personal and emotional," said John Passerini, global vice president of interactive marketing for Sotheby's International Realty, in a statement. 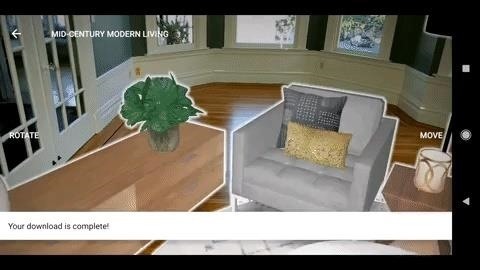 "Introducing an augmented reality component to the homebuying experience takes the consumer on a personal journey that allows them to see a house transformed into a home, their home, through the magic of technology." In addition to viewing the virtual designs, users can also get information on where to purchase the pieces featured in the designs. From there, users can click through to the retailer's website. Sotheby's International Realty used roOomy's platform for AR and VR staging content and app development. "Today, we're seeing growth in adoption rates as they relate to augmented and virtual realities. We're also seeing that large companies with incredibly vast 2D catalogs are unable to transform their libraries into dynamic 3D content that can then be leveraged in AR and VR environments due to high costs of traditional software methods," said Pieter Aarts, CEO and co-founder of roOomy, in a statement to Next Reality. "roOomy offers these businesses the ability to transform their catalogs at a scale and efficiency unavailable until today thanks to roOomy's patented technology, interior design platforms and ARCore and ARKit app-development know-how. They can then tap into the most lucrative home furnishings revenue stream – homebuyers – through the utilization of their 3D content in roOomy Virtual Stagings offered for the real estate industry." Curate won't remain an ARCore exclusive for long, as an iOS version is in development and slated to launch this spring. It should be noted that ARKit version 1.5 is slated to arrive this spring as well, bringing vertical surface detection that would benefit an app like Curate.